T.T. Barber (38), who led the Blue Raiders with 112 tackles, will be facing a Navy offense that is second in the nation at 322 rushing yards per game. There aren’t many opportunities for teams to play against option-based offenses in games, so imagine how difficult it is to simulate it in practice situations. But that’s where the Middle Tennessee defense stands as it prepares for Navy’s attack that features sophomore quarterback Keenan Reynolds, who set the NCAA single-season record for a quarterback with 29 rushing touchdowns this year. "It’s going to take a lot of mental focus," Blue Raiders senior linebacker Roderic Blunt said. "We have to be disciplined. You’ve got to know your keys. Everybody has to rake their own leaves. You can’t be selfish and try to make a play by taking chances. We just have to work as a team." It hasn’t been that long, though, since Middle Tennessee (8-4) faced and had success defending one of the few other teams in the country that successfully runs an option-based offense. 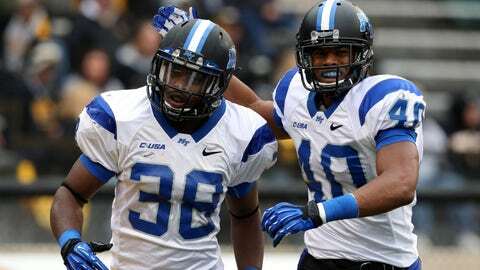 Last season, the Blue Raiders pulled off a 49-28 win at Georgia Tech, which eventually won the ACC Coastal Division. "They are a very dangerous offense with what they run," Blue Raiders coach Rick Stockstill said of Navy (8-4), which closed the regular season with a 34-7 win over rival Army. "You don’t see it very much. They execute at a high level. They do a great job of protecting the ball." While Reynolds has rushed for a team-high 1,260 yards, there are four other Midshipmen who have rushed for at least 300 yards and another four who have gained at least 194 yards. On top of the 29 rushing TDs by Reynolds, the team has added 18 more rushing scores from nine different runners. The Blue Raiders’ rush defense allowed 185.8 yards per game to rank eighth among 14 Conference USA teams. While scoring three rushing touchdowns in Navy’s 12th-straight win over rival Army to give him 29 on the season, Reynolds surpassed the previous record of 27 rushing scores by a quarterback previously held by Navy’s Ricky Dobbs in 2009 and Kansas State’s Collin Klein in 2011. Ironically, Reynolds was a prep standout at Madison (Tenn.) Goodpasture Christian Academy, which is in suburban Nashville, Tenn., and only 45 miles from the Middle Tennessee campus in nearby Murfreesboro. He burst onto the scene at Navy last season, starting eight games and winning six, while becoming the first freshman to start a game for Navy since 1991 and just the third in program history. While he might be known for his running prowess while leading Navy’s option attack, Reynolds is an underrated passer, completing 56 percent (61 of 108) for 898 yards with nine touchdowns and two interceptions last year and he has completed 54 percent (65 of 121) of his throws this year with eight touchdowns and two interceptions. Stockstill realizes that if the Blue Raiders’ defense is going to slow the Navy ground attack, it starts with trying to contain Reynolds at the lead. "Their quarterback is excellent," Stockstill said of the 5-foot-11, 185-pound Reynolds. "Very seldom does he make mistakes. He can beat you with his feet and can beat you with his decision-making process. He is good, and their defense does not give up big plays." 322 — That’s what Navy is averaging in rushing yards per game, good enough to rank second in the nation and trail only second-ranked Auburn (335.7), which is playing No. 1 Florida State in the national championship game. Rounding out the top five teams in rushing are Ohio State (317.5), Northern Illinois (312.50) and Georgia Tech (311.7). While Navy features the prolific option attack led by Reynolds, Middle Tennessee counters with a veteran quarterback in senior Logan Kilgore, who will be making his 38th career start in the bowl game. He also has several program records of his own to boast, including the most career touchdown passes (53). The California native became the first quarterback in program history to pass for more than 2,000 yards in three straight seasons after completing 197 of 322 passes (61.2 percent) for 2,289 yards with 16 touchdowns and 11 interceptions this year. At 6-foot-3 and 201 pounds, he is known for his arm strength and leadership skills that helped net the Blue Raiders consecutive seasons with at least eight wins for the first time since 1991-92. But unlike Navy that leans heavily on the run, the Blue Raiders feature a balanced offensive attack out of its spread offense that has rushed for 2,500 yards this season and passed for a nearly identical 2,489 yards. Despite being slowed by injuries, the running back duo of sophomore Jordan Parker (711) and junior Reggie Whatley (631) combined to gain 1,342 yards. While the storied Navy program will be making its 10th-straight bowl appearance in the last 11 seasons and 19th overall, the Blue Raiders will play in their fourth bowl game since moving to FBS in 2001. And they have carried a chip on their shoulder carried over from last year when they were snubbed for a bowl invitation despite eight wins in their final year of Sun Belt membership. The Blue Raiders made a big splash in their inaugural season in Conference USA, going 6-2 in league play and finishing second in the East Division. Starting with a 49-48 win over East Division winner Marshall, Middle Tennessee closed the season on a five-game win streak and, like Navy, is riding high into the bowl game.